The daughter of Jeff and Lisa Rumbaugh, Lauren calls Dodge City her home. She graduated from Kansas State University this last December with a Bachelor’s Degree in Animal Science & Industry. 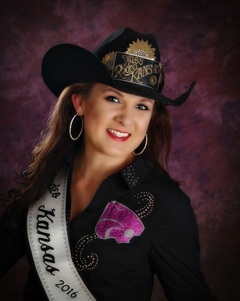 While completing her degree, Lauren was actively involved with many clubs and groups on the K-State campus, including serving as President of the K-State Rodeo Club/Team, and holding offices for the Collegiate Cattle Women group and KSU Chapter of Sigma Alpha Professional Agriculture Sorority. Lauren has spent her time outside of school working on a ranch and feedlot near Manhattan. Her work ethic and interest in the industry has made this a very successful and rewarding experience. Being able to assist in every aspect of the job has helped Lauren gain the knowledge and confidence needed to pursue a career in Agriculture. Growing up, Lauren was an extremely involved member of the Ford County 4-H Program. Her activities included many things, but focused around the horse project for 12 years. She competed at both the County and State level in every event, including barrel racing, pole bending, reining, the 2 and 3 year old snaffle bit futurities and many more. Her involvement with this organization is what shaped her into the woman she is today and she is blessed to still be a part of the program, working with current 4-H members. 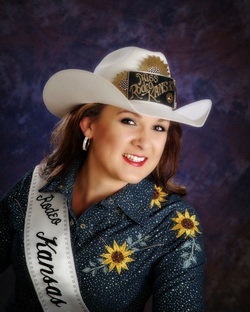 She hopes to be able to continue giving back through her reign as Miss Rodeo Kansas. Lauren will do lots of traveling throughout her year, but what she will enjoy most is returning to places within Kansas that hold a special place in her heart. She hopes to attend many Kansas rodeos and pageants to promote the sport she loves and encourage participation of new young ladies in the pageant world. She is blessed and honored to be representing the great Sunflower State and hopes to give as much back to the State and rodeo industry, as it has given her. In addition to capturing the Miss Rodeo Kansas title, Lauren earned the Horsemanship, Speech, Modeling and Rodeo Knowledge awards. 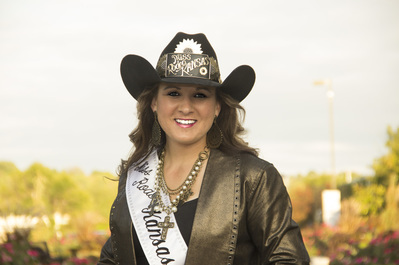 Her reign will conclude in December as she represents the Sunflower State at the Miss Rodeo America Pageant in Las Vegas, Nevada during the Wrangler National Finals Rodeo.